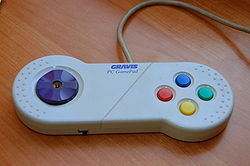 Developed by Arjan Brussee and Cliff Bleszinski (who would later become famous for their work on the Killzone and Unreal/Gears of War franchises, respectively), Jazz was definitely a big step up from the games that preceded it, featuring colorful graphics, a mesmerizing acid jazz soundtrack and most importantly, fluid controls thanks to its native support of the Gravis Gamepad, a PC controller heavily modeled on that of the SNES. 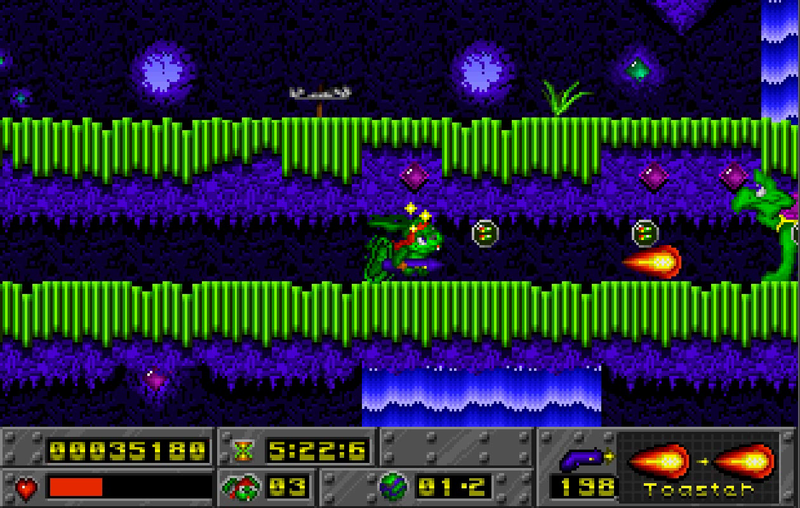 Jazz's gameplay can probably best be described as "Sonic the Hedgehog meets Contra", as much of the time is spent running through colorful maze-like environments, bounding off springboards to reach new areas, hunting for secrets inside fake walls and collecting items, all the while fighting enemies themed after the current stage. 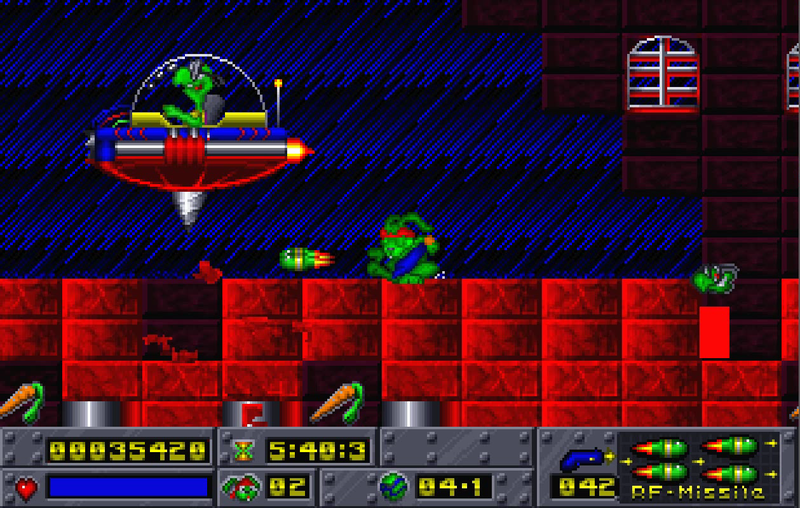 From electrical beams and sparks on the technology-themed stages to floating swords and helmets to the ever-present turtles (minions of the villain Devan Shell). Jazz also carries a gun called the "LFG 2000" that is capable of firing multiple types of projectiles. The basic attack is a small pea-shooter which, in Doom fashion, is pretty much only there so you can break open a weapon capsule and get ahold of something better. Upgrades include a flamethrower that does slightly more damage and fires a larger projectile, a two-way firing "RF Missile" and grenades that rebound off of walls and floors. Pickups are plentiful throughout the stages, but you lose all of the ammunition you've acquired when you lose a life, necessitating that you replenish your stocks again. 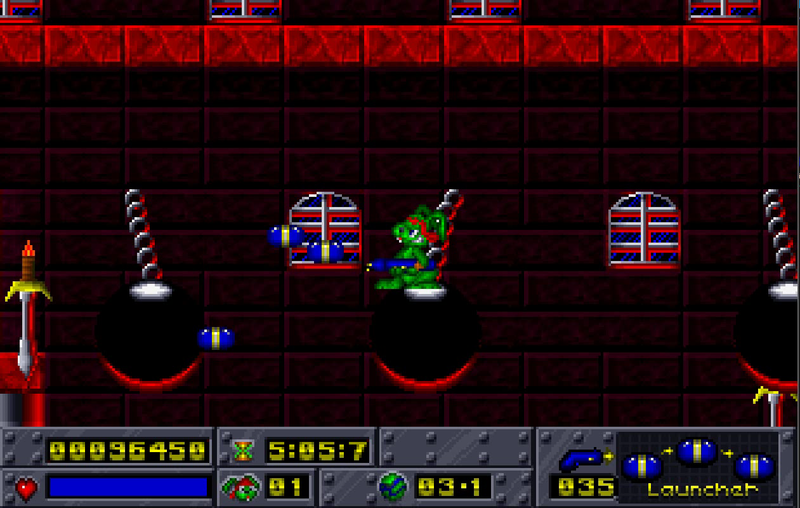 Riding on swinging metal balls suspended on spikes while firing grenades at floating swords. Just another day in platformer-land. 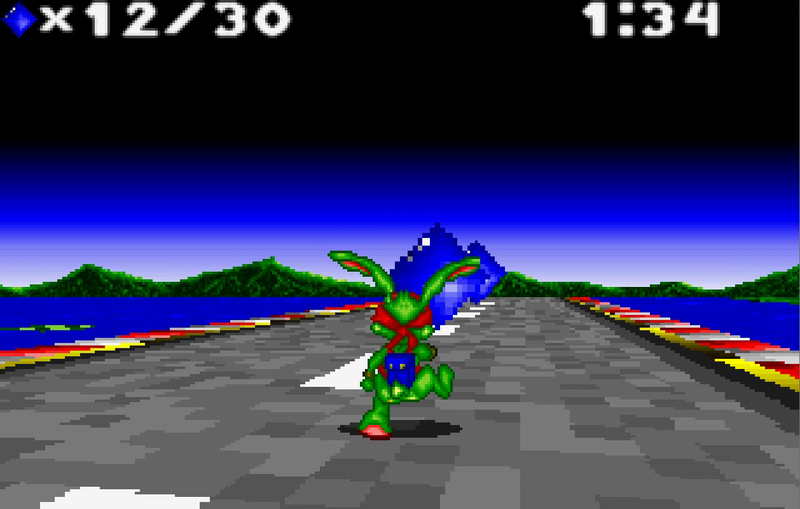 Other powerups include health-restoring carrots (of course) and two very Sonic-esque powerups in the form of a temporary speed-boost and a barrier that sustains a single hit before vanishing. 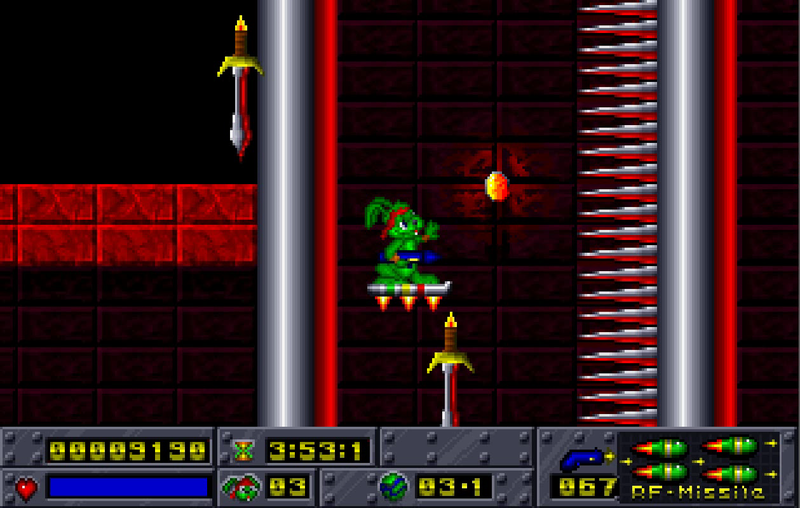 There is also an invincibility powerup, though unlike most games it just makes you immune to harm and doesn't instantly destroy enemies on contact. Jazz's artillery gets some upgrades as well. In addition to a rapid fire upgrade that enables autofire for all of his weapons, he get some added firepower in the form of a bullet-spewing bird (provided he is freed from his cage). Quite a lot of fun, though unfortunately he loses this powerup if he sustains a hit and it doesn't carry over between stages. 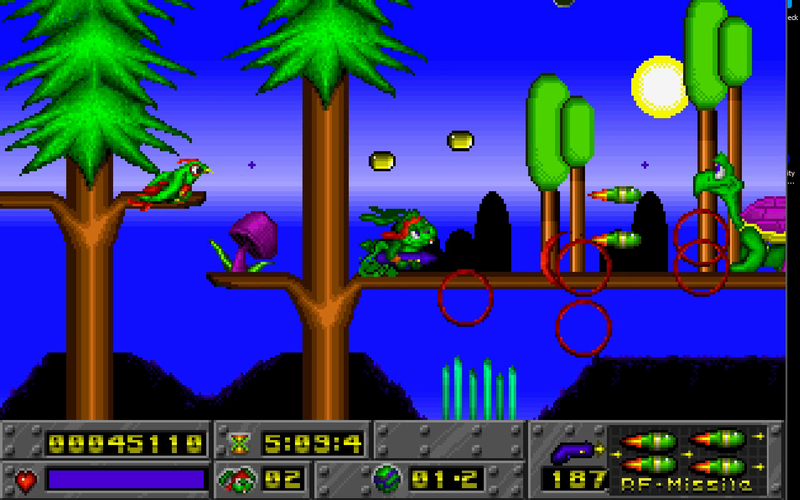 Armed rabbits and carpet-bombing birds attacking a giant turtle. Just another day in platformer-land! Perhaps the most fun powerup, though, comes in the form of a ridable floating platform that enables unrestricted movement for the rest of the stage (or until you lose a life). Makes for some interesting sections, to say the least. You're not in search of Chaos Emeralds or Time Stones here, though: You're just out to collect a set number of gems before time is up in order to collect an extra life while contending with obstacles like hands that impede your movement, sections of road that spin or bounce you and stop sign icons that can boot you out of the level completely. Getting enough before time is up nets you an extra life. Not quite as rewarding as Sonic granting you a better ending for getting all the shiny stones, but still a nice little diversion from the main game. 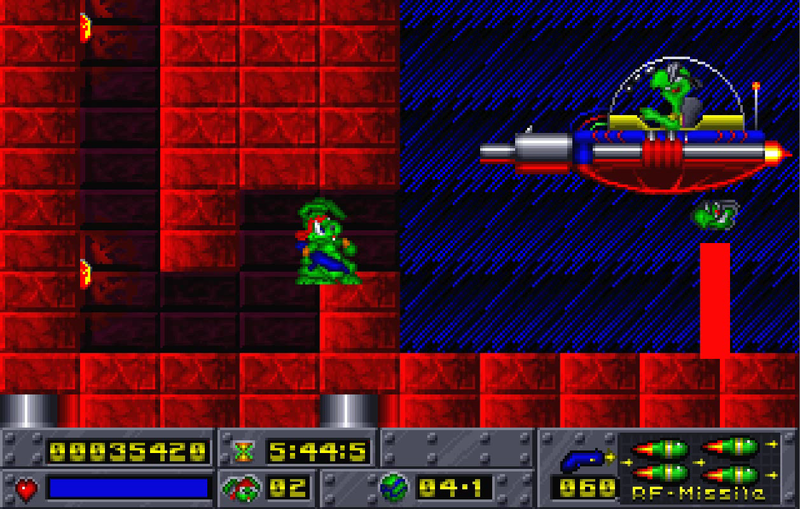 At the end of each of the game's nine episodes (ten in the Christmas-themed special edition), you have a showdown with Devan. In true Dr. Robotnik or Dr. Wily fashion, he usually comes at you with some kind of mechanical war machine while you're just forced to deal with him using only the weapons you have on hand. The first episode's has him in a UFO with a big cannon on the front. When his health drops below half, though, that changes to something a little more... Mario-esque? The bottom of his craft sprouts a drill that he uses to smash away blocks beneath him... which grants you access to health-restoring carrots. He probably didn't think that one through too well. But oh well. 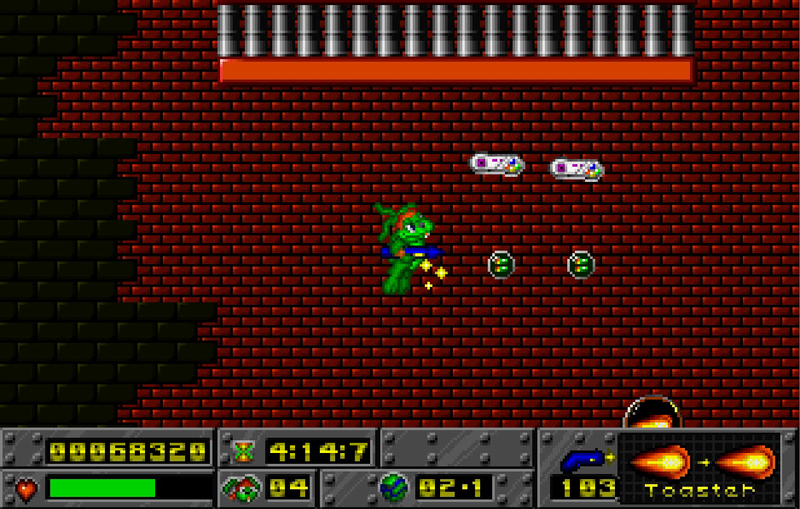 The game couldn't completely escape its DOS roots, though. 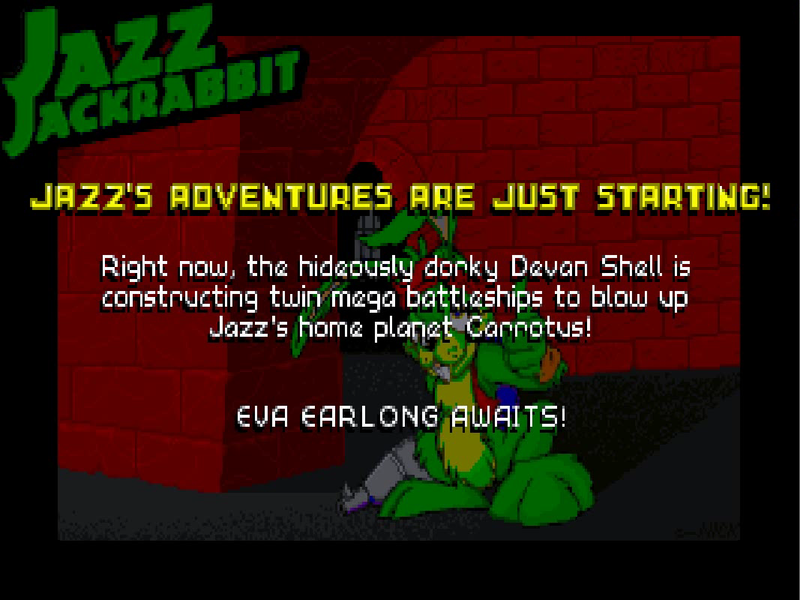 After each boss fight, you get a small bit of story and then return to the main menu to select the episode, putting it in the same realm as games like Duke Nukem and Doom. 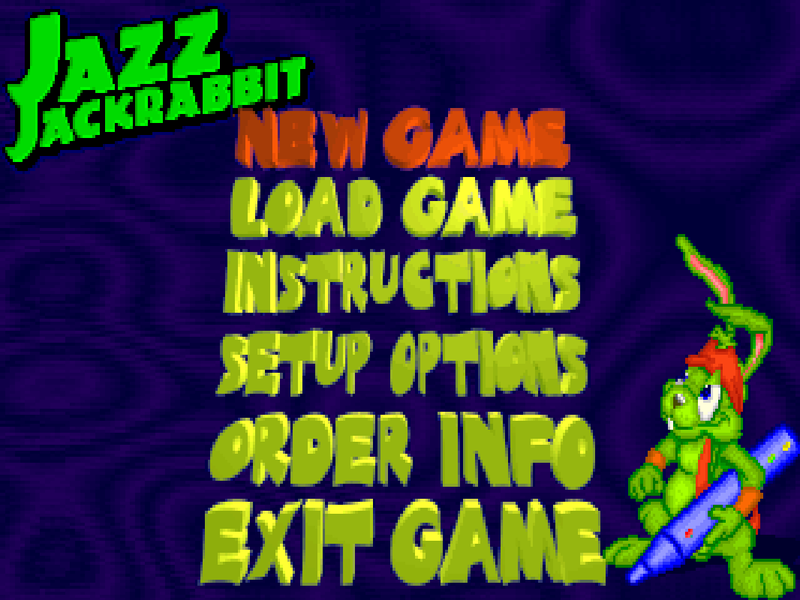 Oh, and you get a high score screen, of course. Which actually saves your high score; a nice touch as most console games of the time didn't have any kind of backup feature to save your scores after you shut off the game.